I’m still loving the glitter trend that’s happening right now. Of course that means I needed to make glitter earrings. Make some for you, for your BFF, your sister, whoever you think needs a little more glitter in their life! In this case, I thought Meg from The Kissy Pearl could use some more glitter. Supplies not shown: paper plate, toothpicks, white glue, piece of styrofoam. 1. First, you’ll need to glue your buttons to your earring posts using the E-6000. You could use another adhesive, but I really recommend using E-6000. Your buttons don’t have to match, as long as they’re the same shape & size. Let these dry. 2. 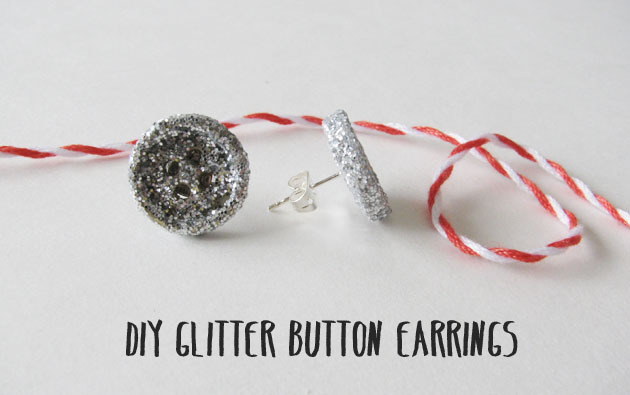 Coat the buttons in white glue (or you can use Modge Podge) and cover them in glitter. Use the toothpick to make sure there’s no glitter stuck in the button holes and to tame any rogue glitter pieces so it’s generally smoothed over.3.Once you’re happy with the coverage, stick in them the styrofoam to let them dry.4. 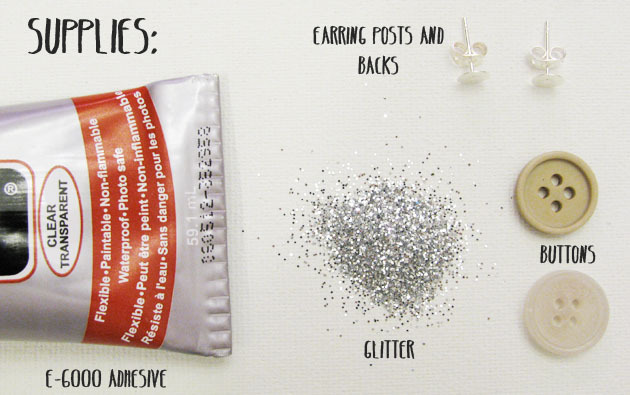 When the glitter & glue is very dry, go over the earrings with another coat of glue to seal them. Then you aren’t going to lose any glitter awesomeness.5. After the sealing coat is dry wear these bad boys in all their glittered glory. Or gift them to a friend who needs more glitter.